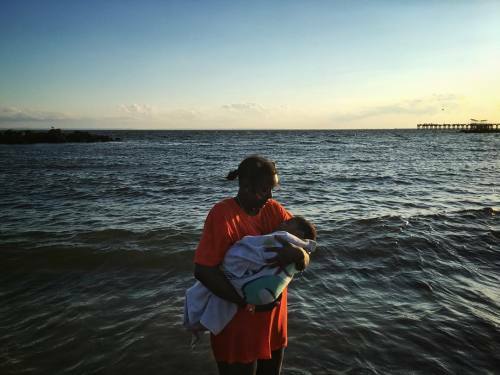 Tamara Atkins holds a sleeping baby in the gentle surf of Coney Island. Many families were out this past weekend enjoying the last days of the summer. The files are super large and crisp and I can't wait to shoot more. #photojournalism #documentary #reportage #streetphotography #iphone6s #iphone6splus #apple #baby #nyc #newyorkcity #coneyisland #boardwalk #beach #coneyisland #brooklyn #kindofawesome" By benlowy on Instagram.